The www.zedce.com website is the property of ETABLISSEMENTS ZEDCE. 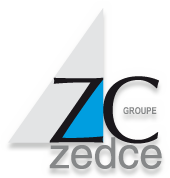 Publication Manager: Serge Chretin, President of ETABLISSEMENTS ZEDCE. Address: 3, rue Gattefossé – 69800 St Priest, France. The information published on this website and more broadly on domain names owned by ETABLISSEMENTS ZEDCE is provided purely for reference only. ETABLISSEMENTS ZEDCE compiles and produces this content using a variety of corroborating sources. ETABLISSEMENTS ZEDCE cannot be held liable for the accuracy and relevance of the contents nor the use of them by users of the website. Any reproduction, modification, publication or copy, in part or in full, of the content presented in the domains belonging to ETABLISSEMENTS ZEDCE, by any means and on any medium whatsoever, is strictly forbidden. ETABLISSEMENTS ZEDCE endeavours to ensure the accuracy of the website content and to keep it up to date. Nevertheless, ETABLISSEMENTS ZEDCE accepts no liability for the information that may be viewed on or from the website, especially the content, its completeness, its accuracy or its reliability. ETABLISSEMENTS ZEDCE gives no guarantee whatsoever, express or implicit, particularly in terms of the lack of interruption or service error or performances or results from the use of the website. The information contained on the website can be altered at any time. ETABLISSEMENTS ZEDCE cannot guarantee that the information is complete, true or up to date. ETABLISSEMENTS ZEDCE may not be held liable towards you or any third party for any direct, indirect or consecutive losses resulting from the use of information and materials contained on the website or other contents to which you may have access via links on the website. The sites linked directly or indirectly are not controlled by ETABLISSEMENTS ZEDCE. As a result, ETABLISSEMENTS ZEDCE accepts no liability for the information published on these websites. The links to external websites are provided for convenience only and imply no guarantee as to their content. The personal data collected are intended for internal use only. Under no circumstances will these data be transferred or sold to third parties. In accordance with French legislation, you have the right to access, modify, rectify or remove any personal data . You can contact us with any request. ETABLISSEMENTS ZEDCE is responsible for processing the data collected on the site www.zedce.com. Users are, in particular, informed that in accordance with Article 32 of the amended French Data Protection Act of 6 January 1978, the information that they provide via these forms to the ETABLISSEMENTS ZEDCE website is necessary in order for a response to be provided to their request and it is intended for the attention of the services in charge of responding to users’ requests for the purposes of monitoring these requests. In accordance with the provisions of Articles 39 and 40 of the French Data Protection Act of 6 January 1978 modified in 2004, users have the right to access, rectify, update and erase information concerning them, and they may exercise this right by contacting ETABLISSEMENTS ZEDCE at 339 rue des charmilles 74460 MARNAZ, stating in the subject of the letter “Droit des personnes” [Data subjects’ rights] and attaching a copy of their identity document. You also have the right to provide guidelines on the fate of your data after your death. Pursuant to the provisions of Article 38 of the French Data Protection Act of 6 January 1978 modified in 2004, users may also object, for lawful reasons, to their data being processed and, without a specific reason and without cost, to their data being used for sales canvassing purposes. Users are informed that a cookie may automatically be installed on their browser when they visit the site www.zedce.com. The information collected on this site shall be retained for a period of three years. The cookie is a block of data that does not allow users to be identified but has the purpose of recording information relating to users’ browsing habits on the site. Browser settings enable users to be informed of the presence of the cookie and if need be, to refuse it in the manner described on the website www.cnil.fr. Users have the right of access, withdrawal and modification of the personal data transmitted via the cookies pursuant to the conditions indicated above. Users of the ETABLISSEMENTS ZEDCE website are required to comply with the provisions of the amended French Data Protection Act of 6 January 1978, the breach of which shall be punishable with criminal penalties. Taking into account the personal information accessed, they must in particular refrain from any collection or misuse, and in general, any act that could harm the privacy or reputation of persons. The contents of ETABLISSEMENTS ZEDCE domains can include links to other websites or other Internet contents not owned by ETABLISSEMENTS ZEDCE. As a result, ETABLISSEMENTS ZEDCE cannot be held liable for this content and the operation of these websites (cookies, personal data collection, etc.). It is possible to create links to the contents compiled or produced by ETABLISSEMENTS ZEDCE. To optimise these links for the benefit of two websites, ETABLISSEMENTS ZEDCE may have to request an alteration to the link (keywords, URL, etc.). All rights of reproduction and publication reserved. © ETABLISSEMENTS ZEDCE 2019.